Animal Farm was one of the earliest animations of a novel. The animated version of George Orwell’s classic novel uses the cartoon format to tell a story that doesn’t obviously lend itself to such a treatment. But I suppose a fable isn’t the obvious format to use to describe the way the Russian revolution developed, so they are keeping to the spirit of the book in that way at least. The problem is that it is a serious story, but cartoons are not really associated with the serious. There are some nice touches. Old Major is made to like a slightly plumper version of Karl Marx. Snowball doesn’t look much like Trotsky but Napoleon is a pretty good Stalin. Other tricks don’t work so well. The comedy turn chick is not any kind of contribution. I was disappointed that Moses the raven is dropped. He represents the church. In the first rush of the idealism of the revolution he is driven out. But as the pigs become more pragmatic they allow him to return – he is just as useful to them as he was to the original regime. The slapstick routine with the chickens fighting back against the pigs by pelting them with eggs is not in the book and is just embarrassing. But on the whole it just about works. I found myself caught up in the familiar story. We see the ideals of the revolution steadily being eroded. The attack that wrecks the farms windmill doesn’t help – though it does show the raw courage of the animals. Even though the pigs are now clearly no longer remotely sympathetic characters, I still found myself cheering on the animals in their heroic fight. In the end the strong carthorse Boxer, who stands for the ordinary worker, having outlived his usefulness is carted off to be made into glue. At this stage the animals lose the last vestiges of their faith in the revolution. But the ending has been changed. In the book, by the end the pigs have become indistinguishable from human farmers. Orwell was a socialist from first to last and to him the tragedy of the Russian revolution was that it left the workers no better off than they had been before it. 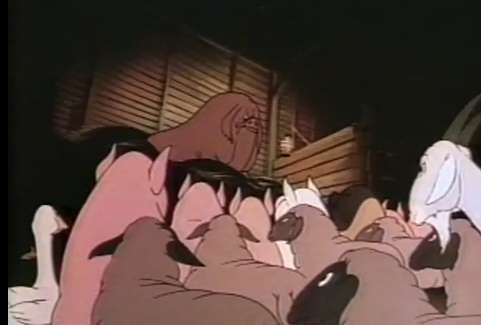 In the animation, the animals are worse off under the pigs and the film closes with the animals about to overthrow the pigs. I felt cheated. I had invested an hour expecting a faithful reproduction of the book, but my trust had been betrayed. I hadn’t actually been carted away and made into glue, but nonetheless I had been taken for a ride. Like Old Major, Orwell did not live to see the film. I think he would have been horrified. His masterly book has been turned into a tawdry piece of propaganda. Squealer would have been proud. You might be interested in this essay comparing Orwell, Tolkien and Lewis. Also, as of today (May 28th 2012) this video of the audio book is up on Youtube. This must be covered by copyright but it has had a lot of views so I assume the publishers are happy about it being there. I saw this version of Animal Farm and it isn't Disney at all but we weren't really told anything about it before we saw it. I suppose you have to look at the historical context. The Cold War had been on for a while, and although he was dead by the time it was released Stalin must have still been alive while it was being made. Imelda who follows the Youtube channel has found a video suggesting it was funded by the CIA. I think they would have been quite happy with the outcome, even if they didn't.